Theatre is a funny business, funny both in the amusing sense and in the weird sense. Second City’s latest revue, Party Today, Panic Tomorrow, is a blunt instrument of a show that is loud, unapologetic, political and fierce. Unlike the more cerebral and brainy Everything is Great Again, the current show has a more frenzied feel about it. It’s more physical, more hard-hitting, and takes more risks. There are parts that will make you feel decidedly uncomfortable and parts that will leave you scratching your head. And I absolutely loved it. It may not be for everyone, but it was for me. The loose premise of the show is that we live in absurd times. Nothing is stable and everything we know is subject to change suddenly and without warning. So why not find the fun in it all? There’s a recurring gag where ensemble members sing about how cute animal videos have millions more views than serious news stories. Ensemble member Brandon Hackett continues the media frenzy with a piece about a rapper that just can’t stop himself from dropping inappropriate comments on his self-promotional YouTube channel, and Colin Munch goes into overdrive as a media guru commenting on the week’s relevant news stories. What a difference one revue to another can make for a performer – I had dismissed Munch as a “splendid ranter” in Everything Is Great Again, but in Party Today, he shows a talent for physical comedy, playing a terrified Toronto cyclist or a six-foot sentient banana. And there is one sketch that I cannot spoil for you where he plays a truly creepy unexpected guest in Devon Hyland’s apartment. It will make your skin crawl and the payoff is brilliant. As funny as Party Today is, it’s also quite unsettling at times. The crowd was an interesting mix of hardened comedians, reviewers, and the general public, and there were certainly moments that elicited nervous titters or stony silence from some (while generating thunderous applause from others.) Hackett – the show’s only Black performer – is lit in a garish spotlight. “I’m just getting my ID, officer. I don’t have a gun. I’m just reaching into my pocket for my ID.” A shot rings out, Hackett slumps to the floor, and there’s a moment of shocked silence before a cheerful woman sticks her head through the door and asks, “Ready to go, hon?” “Yup, just practicing!” Hackett chirps as he bounces to his feet. Canada’s missing and murdered Indigenous women and girls, street harassment, and fat shaming are all dealt with ruthlessly. In one of my favourite sketches, the ensemble acts out a horrifying/hilarious game show called Wolves. “Look at this guy!” roars the host. “He didn’t give up his seat on the TTC for a pregnant woman? Does he survive, or does he get thrown to the wolves?” Of course the crowd is whipped up into a frenzy. Of course the wolves rip the contestant to pieces. There’s a beat, and the host says solemnly, “He had a daughter.” It’s funny in a way that makes you feel guilty for laughing, and stays with you long after the show is over. I’ve only mentioned the male members of the ensemble but it would be criminal of me to ignore the women. There’s no getting away from the fact that this is a refreshing feminist-flavoured comedy. Nadine Djoury, Allana Reoch, and should-be-declared-a-civic-treasure Ann Pornel have a jaw-droppingly powerful sketch where they dance flirtatiously to Shania Twain and strip down to their underwear. There’s hoots and whistles, the music stops, and the performers just look at the audience. The silence stretches, becomes uncomfortable. Then one of them speaks. “Well...these are our bodies. We guessed you’ve been thinking about them all evening.” And what follows is funny, frank, and powerful. This moment alone makes this show a must-see. 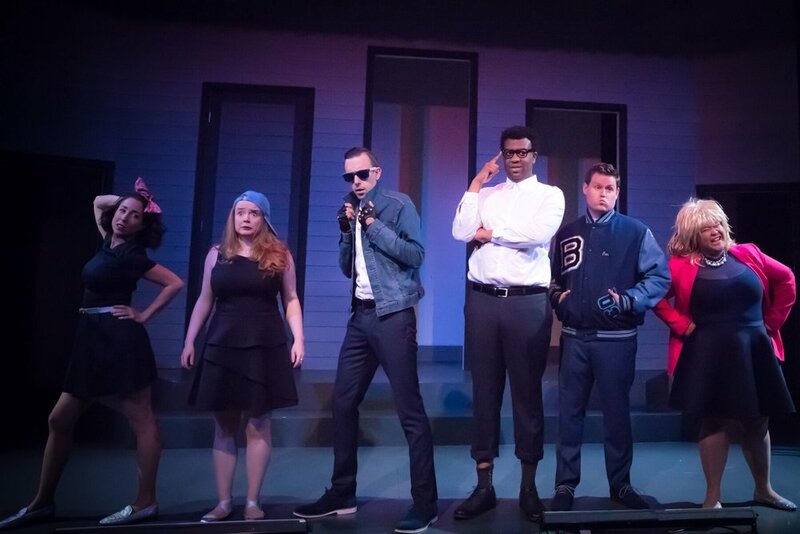 There’s a few improvised sketches that are wildly successful; a Greek tragedy with product placement is lively and absurd, and an 80s-themed high school dance with bonus audience participation is pure nostalgic joy. It’s a perfectly sweet finish to a surprisingly hard-hitting show. Hats off to the Second City ensemble for embracing the funny in all its senses. Party Today, Panic Tomorrow plays at the The Second City at 51 Mercer Street for a six-month run. Tickets range from $30 - $45 and are available at The Second City box office (416-343-0011) or online at secondcity.com.